This tape/adhesive is great for adhering paper to paper, plain paper to metallic paper to heavier more textured papers. You can use this tape to hold down flaps to make a folder, put in envelope liner and hold down light weight embellishments. YES, Glue can do the same thing but if you use this adhesive, you don't have to wait for the glue to dry, and you won't have any messy overflow. 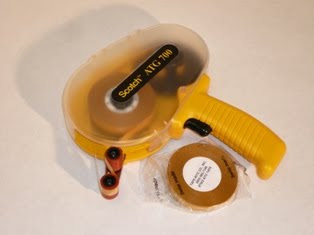 The tape is easy to use in the ATG dispenser. Very clear instructions given on how to load the dispenser properly and on how to apply the adhesive. So don't just read this, give us a call at 800-882-7348 and visit our website,www.taperite.com , to learn more and get your ATG Tape today!